Benefit from Atos SIPS payment module on your PEEL SHOPPING online store! Benefit from ATOS SIPS payment module on your online store PEEL SHOPPING (versions >= 6)! 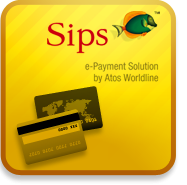 The SIPS ATOS payment module is an online payment solution with a very high level of security. It allows customers to pay on your PEEL SHOPPING ecommerce website and enjoy all the features on all remote sales channels. You can also, depending on your contract, receive transactions with Visa, Visa Electron, Bancontact / Mister, Carte Bleue, MasterCard, Maestro, sSwitch / Solo / Delta or even American Express. We can also install the module Atos SIPS on websites or online shops which do not use technology PEEL SHOPPING. Need for any additional information, please contact us on +33 (0) 1 75 43 67 97 or via our contact form to ask us any questions directly on the implementation of this module CB ecommerce on your site.